To Cite: Choi B, Joo Jeong Y, Lee G, Song S, Cho M, et al. Drainage of the Inferior Vena Cava Into the Left Atrium with Atrial Septal Defect and Partial Anomalous Pulmonary Venous Return: Initial and Postoperative Computed Tomography (CT) Findings, Iran J Radiol. 2018 ; 15(2):e13878. doi: 10.5812/iranjradiol.13878. Anomalous drainage of the inferior vena cava into the left atrium is a rare congenital vascular disorder. It can occur with atrial septal defect, anomalous pulmonary venous drainage, and pulmonary arteriovenous fistula. Hereby we describe the computed tomography (CT) findings of a rare combination of drainage of the inferior vena cava associated with atrial septal defect and partial anomalous pulmonary venous return. CT angiography is useful for early detection of this combined anomaly and for proper surgical planning. Anomalous drainage of the inferior vena cava (IVC) into the left atrium is a rare congenital vascular disorder (1). It can occur with atrial septal defect (ASD), anomalous pulmonary venous drainage, and pulmonary arteriovenous fistula (2). This case report describes the computed tomography (CT) findings of a rare combination of drainage of the inferior vena cava associated with atrial septal defect and partial anomalous pulmonary venous return. A 7-year-old girl was referred to our hospital for evaluation of palpitations and chest discomfort she had for 3 years. Clinically, there was no auscultatory abnormality. Her blood pressure was 90/60 mmHg and heart rate was 91 beats/min. Oxygen saturation was 98% at rest. An electrocardiogram (ECG) showed normal sinus rhythm and right ventricular hypertrophy. A chest radiograph revealed mild cardiomegaly with clear lung fields. Transthoracic echocardiography (TTE) revealed a large ASD with no posterior rim. The right ventricle was dilated, with a left-to-right shunt. However, there was no evidence of partial anomalous pulmonary venous return (PAPVR) or other vascular anomaly on TTE. To evaluate the combined anomaly, retrospective ECG-gated CT angiography was performed. CT angiography showed S, D, S segmental anatomy with atrioventricular and ventriculoarterial concordance. A large ASD secundum, 3.1 cm × 3.8 cm in size (Figure 1A and B) was noted, and the right superior pulmonary vein was seen draining into the right atrium, suggestive of PAPVR (Figure 1C). Abnormal drainage of the IVC into the left atrium was likewise suspected (Figure 1D). There was no evidence of pulmonary arteriovenous fistula or other cardiac anomalies. Figure 1. Axial reformatted image (A) and short axis image (B) of retrospective electrocardiogram-gated computed tomography (CT) angiography showed large atrial septal defect (ASD, secundum type) with posterior rim deficiency. The size of the ASD was 3.1 × 3.8 cm. Axial reformatted image (C) showed right superior pulmonary vein (arrow) draining into the right atrium, suggestive of partial anomalous pulmonary venous return (PAPVR). Oblique sagittal reformatted image (D) and short axis image (B) demonstrate the inferior vena cava (IVC) (arrow) draining directly into the left atrium. 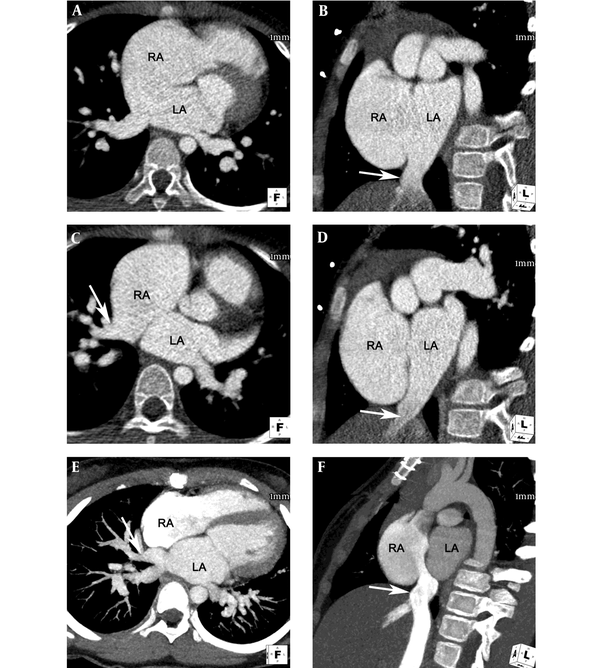 Maximum intensity projection images of postoperative follow-up CT angiography show successful correction of the ASD, PAPVR, and anomalous drainage of the IVC into the left atrium. Note the superior pulmonary vein (arrow) draining into the left atrium (E) and the IVC (arrow) draining into the right atrium without significant stenosis (F). The operation was conducted via median sternotomy. Cardiopulmonary bypass was established with bicaval cannulation, and the heart was arrested using antegrade cold blood cardioplegia. The right atrium was opened, which revealed a large ASD secundum, the left-ward shift of IVC, and PAPVR. The defect was closed with a patch of fresh autologous pericardium. The right superior pulmonary vein was redirected to the left atrium and the IVC was redirected to the right atrium. The postoperative course was uneventful. Prospective ECG-gated CT angiography performed 2 years after the operation revealed successful correction of ASD, PAPVR, and anomalous drainage of the IVC into the left atrium (Figure 1E and F). Anomalous drainage of the IVC into the left atrium is a rare congenital vascular disorder, first described by Gardner in 1955 (1). Only 19 cases with anomalous drainage of the IVC into the left atrium including our case have been reported in the English literature (Table 1). An ASD occurs with the condition in approximately 70% of the reported cases. Anomalous pulmonary venous drainage and pulmonary arteriovenous fistula may also be associated (2). Although two patients had a combined PAPVR and ASD similar to our patient, invasive angiography was used for diagnosis. Abbreviations: ASD, atrial septal defect; DOE, dyspnea on exertion; O2, oxygen; PAPVR, partial anomalous pulmonary venous return; PDA, patent ductus arteriosus; PFO, patent foramen ovale; TAPVR, total anomalous pulmonary venous return; TOF, tetralogy of Fallot. Anomalous drainage of the IVC into the left atrium results from persistence of the right valve of the sinus venosus. In the embryo, the sinus venosus receives the cardinal, umbilical, and vitelline veins. The sinus venosus communicates with the primitive atrium via an orifice that has a right and left valve. As the heart develops, the IVC formed then drains into the sinus venosus, which normally migrates to the right of the midline. 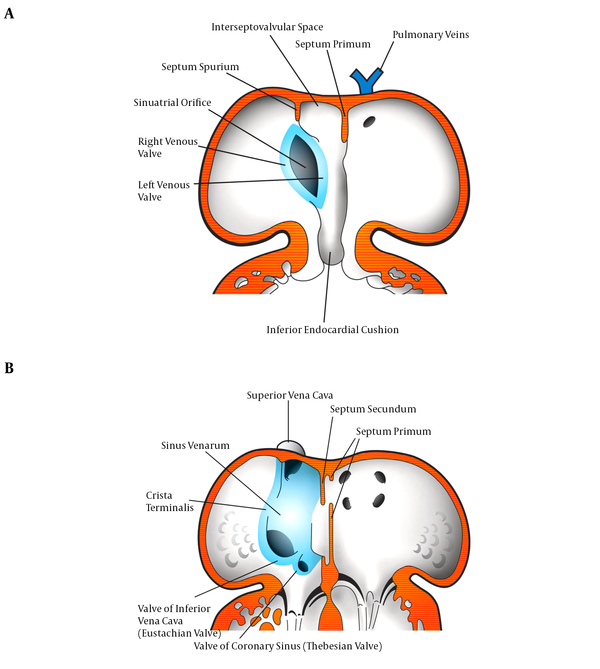 The right valve of the sinus venosus usually atrophies, leaving only the crista terminalis, Eustachian valve, and Thebesian valves (Figure 2). If the right sinus venosus valve fails to regress and fuses with the superior part of the septum secundum, the IVC will drain into the left atrium (2, 5, 18). Figure 2. Schema of the development of venous valves in 5th week of pregnancy (A) and fetal stage (B) [modified from (18)]. We herein present a case of a 7-year-old girl with ASD combined with PAPVR and drainage of the IVC into the left atrium. In our case, the TTE failed to demonstrate the anomalous IVC drainage into the left atrium and the PAPVR in a patient with ASD because of the limited echocardiographic window. The diagnosis was eventually established using CT angiography. CT angiography can be useful for early detection of this complex anomaly and for proper surgical planning. To our knowledge, CT images of this rare combination and postoperative follow-up CT have not been reported in English literature. 1. Gardner DL, Cole L. Long survival with inferior vena cava draining into left atrium. Br Heart J. 1955;17(1):93-7. [PubMed: 13230352]. 2. Aliter H, El-Haddad A, Gallo R, Al-Halees Z. Atrial septal defect with drainage of the inferior vena cava into the left atrium. Eur J Cardiothorac Surg. 2011;40(5):1256-7. doi: 10.1016/j.ejcts.2011.02.011. [PubMed: 21420312]. 3. Meadows WR, Bergstrand I, Sharp JT. Isolated anomalous connection of a great vein to the left atrium. The syndrome of cyanosis and clubbing, "normal" heart, and left ventricular hypertrophy on electrocardiogram. Circulation. 1961;24:669-76. [PubMed: 13768779]. 4. Gallaher ME, Sperling DR, Gwinn JL, Meyer BW, Fyler DC. Functional Drainage of the Inferior Vena Cava into the Left Atrium--Three Cases. Am J Cardiol. 1963;12:561-6. [PubMed: 14067439]. 5. Black H, Smith GT, Goodale WT. Anomalous Inferior Vena Cava Draining into the Left Atrium Associated with Intact Interatrial Septum and Multiple Pulmonary Arteriovenous Fistulae. Circulation. 1964;29:258-67. [PubMed: 14119391]. 6. Gautam HP. Left atrial inferior vena cava with atrial septal defect. J Thorac Cardiovasc Surg. 1968;55(6):827-9. [PubMed: 5651656]. 7. Kim YS, Serratto M, Long DM, Hastreiter AR. Left Atrial Inferior Vena Cava with Atrial Septal Defect. Ann Thorac Surg. 1971;11(2):165-70. doi: 10.1016/s0003-4975(10)65433-1. 8. Singh A, Doyle EF, Danilowicz D, Spencer FC. Masked abnormal drainage of the inferior vena cava into the left atrium. Am J Cardiol. 1976;38(2):261-4. [PubMed: 952269]. 9. Richardson JV, Doty DB. Isolated Anomalous Inferior Vena Cava Connection to the Left Atrium: Report of a Successful Surgical Case and Review of the Literature. Cardiovasc Dis. 1979;6(1):44-9. [PubMed: 15216024]. 10. Sanchez HE, Human DG. Drainage of the inferior vena cava to the left atrium. Pediatr Cardiol. 1986;6(4):207-9. doi: 10.1007/BF02311000. [PubMed: 3703692]. 11. Lamb RK, Qureshi SA, Patel RG, Hamilton DI. Anomalous drainage of inferior vena cava to left atrium in association with total anomalous pulmonary venous drainage. Thorax. 1987;42(11):907-8. [PubMed: 3424277]. 12. Meyers DG, Latson LA, McManus BM, Fleming WH. Anomalous drainage of the inferior vena cava into a left atrial connection: a case report involving a 41-year-old man. Cathet Cardiovasc Diagn. 1989;16(4):239-44. [PubMed: 2650882]. 13. Cabrera A, Arriola J, Llorente A. Anomalous connection of inferior vena cava to the left atrium. Int J Cardiol. 1994;46(1):79-81. [PubMed: 7960281]. 14. Genoni M, Jenni R, Vogt PR, Germann R, Turina MI. Drainage of the inferior vena cava to the left atrium. Ann Thorac Surg. 1999;67(2):543-5. [PubMed: 10197690]. 15. Burri H, Vuille C, Sierra J, Didier D, Lerch R, Kalangos A. Drainage of the inferior vena cava to the left atrium. Echocardiography. 2003;20(2):185-9. [PubMed: 12848686]. 16. Al-Ammouri I, Shomali W, Alsmady MM, Abu Abeeleh M, Mustafa K, Massad I, et al. Anomalous inferior vena cava drainage to the left atrium with successful staged repair in a 32-year-old woman with arthritis. Pediatr Cardiol. 2010;31(6):912-4. doi: 10.1007/s00246-010-9738-1. [PubMed: 20544188]. 17. Basquin A, Bajolle F, Bonnet D. Inferior vena cava into the left atrium. Arch Cardiovasc Dis. 2013;106(8-9):455-6. doi: 10.1016/j.acvd.2011.12.008. [PubMed: 23791593]. 18. Sadler TW. Cardiovascular system, Langman's Medical Embryology. 2017. Available from: https://healtheappointments.com/chapter-13-cardiovascular-system-essays/2/.